Cosmic dust (also known as star dust and space dust) is a type of dust. It is very small crystals sent out from stars. 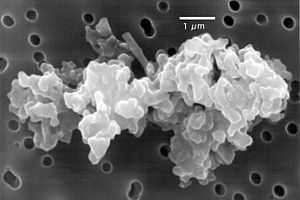 Cosmic dust is composed of particles in space which are a few molecules to 0.1 mm in size. Cosmic dust can be further distinguished by its astronomical location; for example: intergalactic dust, interstellar dust, circumplanetary dust, dust clouds around other stars, and the major interplanetary dust components to our own zodiacal dust complex (seen in visible light as the zodiacal light): Comet dust, asteroidal dust plus some of the less signficant contributors: Kuiper belt dust, interstellar dust passing through our solar system, and beta-meteoroids. Cosmic dust was once solely an annoyance to astronomers, as it obscures objects they wish to observe. When infrared astronomy began, those so-called annoying dust particles were observed to be significant and vital components of astrophysical processes. For example, the dust can drive the mass loss when a star is nearing the end of its life, play a part in the early stages of star formation, and form planets. In our own solar system, dust plays a major role in the zodiacal light, Saturn's B Ring spokes, the outer diffuse planetary rings at Jupiter, Saturn, Uranus and Neptune, the resonant dust ring at the Earth, and comets. 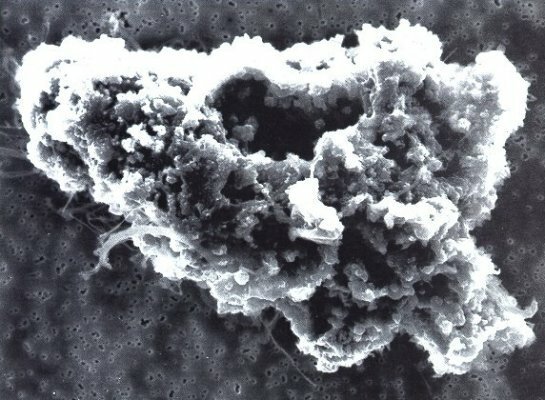 The study of dust is a many-faceted research topic that brings together different scientific fields: physics (solid-state, electromagnetic theory, surface physics, statistical physics, thermal physics), (fractal mathematics), chemistry (chemical reactions on grain surfaces), meteoritics, as well as every branch of astronomy and astrophysics. These disparate research areas can be linked by the following theme: the cosmic dust particles evolve cyclically; chemically, physically and dynamically. The evolution of dust traces out paths in which the universe recycles material. Observations and measurements of cosmic dust in different regions provide an important insight into the universe's recycling processes, where astronomers consider dust as in its most recycled state. The astronomers accumulate observational ‘snapshots’ of dust at different stages of its life and, over time, form a more complete movie of the universe's complicated recycling steps. 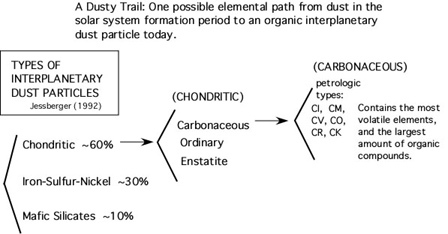 Cosmic dust can be detected by indirect methods utilizing the radiative properties of cosmic dust. Cosmic dust can also be detected directly using a variety of collection methods and from a variety of collection locations. At the Earth, generally, an average of 40 tons per day of extraterrestrial material falls to the Earth. The Earth-falling dust particles are collected in the Earth's atmosphere using plate collectors under the wings of stratospheric-flying NASA airplanes and collected from surface deposits on the large Earth ice-masses (Antarctica and Greenland / the Arctic) and in deep-sea sediments. 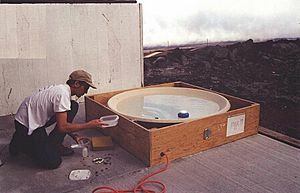 Don Brownlee at the University of Washington in Seattle first reliably identified the extraterrestrial nature of collected dust particles in the later 1970s. In interplanetary space, dust detectors on planetary spacecraft have been built and flown, some are presently flying, and more are presently being built to fly. Cosmic dust Facts for Kids. Kiddle Encyclopedia.